to hand over the Littles! Mother's Day is a day for Dad to take the wee-ones and let you have some time to yourself. rays of sunshine in your life!!! You get an extra day for yourself!! Who knew that becoming a baby factory could be so rewarding? send it back and then I am done. "Self, you should take a picture of your crayons." And I posted it about a month ago here on the blog-a-roo. My crayons are like Movie Star Crayons!!! That is just wacky to me! I have my colored pencils in those exact same containers!!! Only my labels are white and written in the colors that are in the drawers! How funny! I love them though though! They are the perfect size and help keep everything organized nicely!! hahahah! Now you're going to get a million views on this page! Sneaky squirrel! Hahaha Squirrels, you crack me up. As soon you have your Etsy up and running, definitely let me know and I'll follow/favorite you on there! 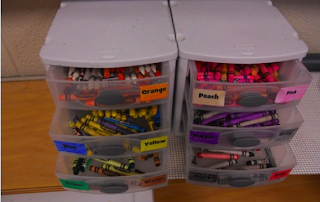 There was a class I was in for a week and the kids desperately needed new crayons and she had unlabeled tubs (gasp, I know! And she's my buddy too...hmmm maybe I should hook a girl up...) anyway, she had her crayons bundled up and kind of organized like that. I replenished the kiddos crayons and they were sooo excited! Hope you enjoy your father's day oops meant mother's day sequel! I did see that on Pinterest!! Isn't it great when proper credit is given?? I use the same drawers to organize my crayons, markers, pencils, etc. Happy Father's Day! oh that's what it is...I am jet lagged from your trip too. Now I understand. I am SO doing that crayon idea. I saw it on pinterest and had NO idea it was yours until I read Going Nutty under it. It's GENIUS. Absolutely hilarious~!! I laughed the whole way through. Love the idea for Father's Day. Brilliant!!! I have one year old twins and I am soooo going to try this next year!!! I am following you now and if you have a chance I would love for you to check out my blog sometime! I totally have this pinned! I pinned it because it's a great idea. I actually found your blog through the Oh'Boy 4th Grade link. So weird, lol. Also just wanted to say I'm your newest follower! Squirrels, just left you a comment on your comment, and then realized you probably won't see it! So go back and read said reply to comment. Where have you been? I'm missing my morning giggles!